Introduces the relationships among Sabino Canyon, the Santa Catalina Mountains, and the Tucson Basin. Strike It Rich introduces students to the dynamic geologic relationship of Sabino Canyon, the Santa Catalina Mountains and the Tucson Basin. The ongoing effects of weathering, erosion and recent flooding are observed and explored. Characteristics of five minerals (quartz, feldspar, mica, magnetite, and garnet) that make up the Catalina gneiss found in this area are compared and these minerals identified in rocks and sand. The students also learn to pan for garnets in Sabino Creek. PO1. Observe common objects using multiple senses. PO1. Demonstrate safe behavior and appropriate procedures (e.g., use of instruments, materials, organisms) in all science inquiry. PO2. 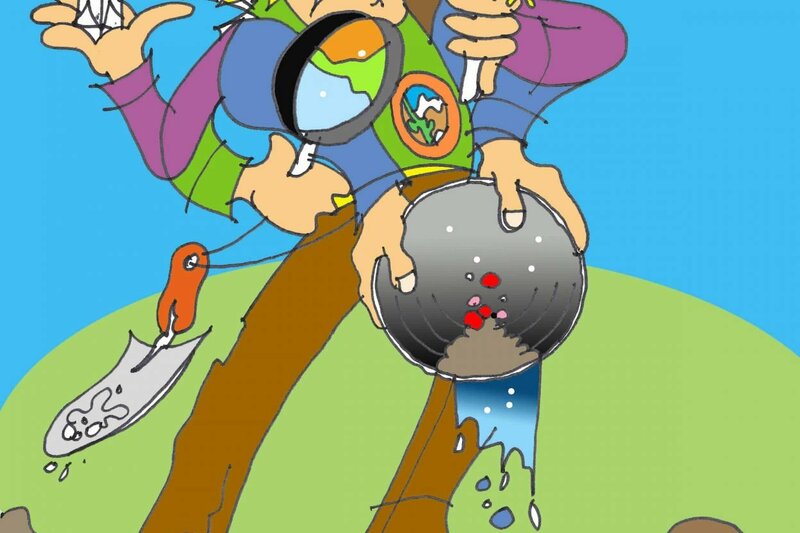 Participate in guided investigations in life, physical and Earth and space sciences. PO1. Describe the following basic Earth materials: rocks, soil, water. PO2. Compare the following physical properties of basic Earth materials : color, texture, capacity to retain water. PO3. Identify common uses (e.g., construction, decoration) of basic Earth materials (i.e., rocks, water, soil). PO4. Identify the following as being natural resources: air, water, soil, trees, wildlife. PO5. Identify ways to conserve natural resources (e.g., reduce, reuse, recycle, find alternatives). PO1. Identify the following characteristics of seasonal weather patterns: temperature, type of precipitation, wind. PO2. Describe the beneficial and harmful impacts of natural events and human activities on the environment (e.g., Forest fires, flooding, pesticides). PO1. Identify the layers of the Earth: crust, mantle, core. (inner and outer). PO2. Describe the different types of rocks and how they are formed: metamorphic, igneous, sedimentary. PO3. Classify rocks based on the following physical properties: color, texture. PO1. Describe how natural events and human activities have positive and negative impacts on environments (e.g., fire, floods, pollution, dams). PO1. Identify the Earth processes that cause erosion. PO2. Describe how currents and wind cause erosion and land changes. PO3. Describe the role that water plays in the following processes that alter the Earths surface features: erosion, deposition, weathering. PO4. Compare rapid and slow processes that change the Earths surface, including: Rapid earthquakes, volcanoes, floods. Slow wind, weathering. PO5. Identify the Earth events that cause changes in atmospheric conditions (e.g., volcanic eruptions, forest fires). PO6. Analyze evidence that indicates life and environmental conditions have changed (e.g., tree rings, fish fossils in desert regions, ice cores). PO1. Identify the sources of water within an environment (e.g., ground water, surface water, atmospheric water, glaciers). PO 1.Explain the impacts of natural hazards on habitats (e.g., global warming, floods, asteroid or large meteor impacts). Strike It Rich (SIR) teaches students about geology, specifically the geology of Sabino Canyon and the Catalina Mountains. It spices the science with some fun, as students have a chance to pan for garnets in Sabino Creek. We ask the students to observe what they see around them – the rocks, canyon, mountains, water. We orient them by giving names they might recognize to these features: Catalina Mountains, Sabino Canyon, Sabino Creek. SIR introduces students to the study of geology and the structure of the Earth – the crust, mantle, and core. We review the building up of the Catalina Mountains and how they are worn down by weathering and erosion. We use the hillside cliffs and boulders, cobbles, gravel, and sand in the stream channel to illustrate these principles. We focus on the role of water (rain and snow) and how it cuts canyons, creates floods, moves sediments, and forms aquifers where groundwater is stored. We ask students to consider how they can affect the balance between replenishment and withdrawal in the aquifers that supply Tucson’s water. SIR introduces students to rocks and minerals, noting that minerals are the’building blocks’ of rocks and that rocks are a combination of minerals. Igneous rock: Called ‘fire rock’ because it forms from molten (melted) rock that rises within the earth’s crust. If the rock cools slowly underground, it forms granite. If it spews out onto the surface it is called lava. Sedimentary rock: For thousands, even millions of years, weathered pieces from earth’s surface wash downstream and settle to the bottom in rivers, lakes, and oceans, layer after layer. The weight of the layers pressing down turns the bottom ones into rock. Metamorphic rock: These rocks are formed when sedimentary or igneous rocks are “morphed” into a different type of rock. The original rock is subjected to pressure and heat, causing changes in the minerals and therefore in the rock itself. Gneiss: The type of metamorphic rock that makes up the front range of the Catalina Mountains as seen from Tucson – called Catalina Gneiss. We ask the students to compare individual samples of pure minerals to Catalina Gneiss and understand that this is like comparing the ingredients in the cake (minerals) with the whole cake (rocks). SIR introduces the technique of panning and why it works to separate minerals (the specific gravity or ‘heft’ of each mineral makes each behave differently in the stream and in the pan). SIR teaching materials include a model of the Earth and of Basin and Range mountains, a map “Sabino to the Sea”, rock and mineral photo cards and physical hand samples, tools for examining specimens, authentic gold pans. Geology: The study of the Earth, past and present. Geologists study the rocks that make up Earth’s crust and the physical, chemical, and biological processes that affect the Earth’s surface and interior. Structure of Earth: The interior structure of the Earth is layered in spherical shells, like an onion. These layers are defined by their chemical composition and their response to pressure and temperature. The distance from the surface to the center of Earth is almost 4,000 miles. Crust:The rigid, outer layer of the ‘onion’ which, along with a rigid layer of the upper mantle, make up the lithosphere. The lithosphere is broken up into huge, thick plates that drift atop the soft, plastic-like underlying mantle. Mantle: The region between the crust and core of Earth. It accounts for about 85% of the weight and mass of the Earth. The upper part consists of very hard, rigid rock (part of the lithosphere). Next comes superheated solid rock that is very weak. Below that, for the next several hundred miles, the mantle is made up of very solid and sturdy rock materials. Core: The innermost part of the earth composed mostly of the metals iron and nickel. The outer core is made up of superheated liquid molten lava. The inner core at the center of Earth is believed to be a solid ball. Building Mountains: The Santa Catalina Mountains were formed over time by several processes. Intrusion: Magma (molten rock) pushes up into the Earth’s crust and cools slowly to form granite. It does not reach the surface, but lifts up rocks that are above, making a dome shape at the surface. Volcanism: Magma (molten rock) pushes up through the Earth’s crust, reaching the surface and forming lava. The magma may flow onto the surface or explode onto the surface, forming volcanoes. Metamorphism: The process by which existing rocks are changed in composition, texture, or structure by extreme heat and pressure. Basin & Range Faulting: Basin and Range faulting occurred as the Earth’s crust was stretched and pulled in opposite directions by forces within the mantle. Movement along breaks in the crustal rocks (faults) caused some blocks of land to subside (the lowland where Tucson is located), while other blocks maintained their position (The Santa Catalinas and other mountains you see from Tucson). Destroying Mountains:Mountains, including the Santa Catalina Mountains, are worn down over time by two primary processes. Weathering: Weathering takes place as rocks are broken down into smaller and smaller pieces. It can happen in different ways, including: water freezing in cracks and pushing rocks apart (water takes 10% more space when frozen); chemical reactions loosening bonds holding rocks and minerals together; and plant roots extending into crevices, wedging rocks apart. Erosion:Erosion takes place when weathered rock pieces are moved from one location to another. Flowing water is a primary force of erosion, but wind can also carry small rock particles. Canyon: A canyon is a deep gorge between hill slopes or cliffs. It is carved from the landscape primarily by the erosive force of running water. Aquifer: An aquifer is a geological formation that contains water and allows the water to move through the formation. Aquifers can supply water for wells, springs, and rivers. Sediment: Sediment is made from particles of rock, broken down by weathering. The particles are transported by erosion (water, wind, gravity). Examples are: boulders, gravel, sand. The sediments that have been deposited over time in the Tucson Basin form the aquifer that supplies much of our drinking water. Rocks: A rock is a solid combination of one or more minerals. Rocks create the landscapes on the surface of the Earth, like mountains and canyons. Metamorphic rock: These rocks are formed when sedimentary or igneous rocks are “morphed” or changed. The original rock is subjected to pressure and heat, causing changes in the minerals and therefore in the rock itself. Gneiss: A type of metamorphic rock that makes up the part of the Catalina Mountains you can see from Tucson. That rock is called Catalina Gneiss. The ‘building blocks’ that make up rocks. Minerals are composed of the same substances (a combination of chemicals) throughout. Table salt or sodium chloride crystals are great crystals to try if you’ve never grown crystals before because it’s easy to find salt and water (the ingredients), the crystals are non-toxic, and no special equipment is required. Let’s get started! Stir salt into boiling hot water until no more salt will dissolve (crystals start to appear at the bottom of the container). Be sure the water is as close to boiling as possible. Hot tap water is not sufficient for making the solution. If you want crystals quickly, you can soak a piece of cardboard in this supersaturated salt solution. Once it is soggy, place it on a plate or pan and set it in a warm and sunny location to dry out. Numerous small salt crystals will form. If you are trying to form a larger, perfect cubic crystal, you will want to make a seed crystal (a small crystal introduced into a liquid to act as a nucleus for crystallization). To grow a big crystal from a seed crystal, carefully pour the supersaturated salt solution into a clean container (so no undissolved salt gets in), allow the solution to cool, then hang the seed crystal in the solution from a pencil or knife placed across the top of the container. You could cover the container with a coffee filter if you like. Set the container in a location where it can remain undisturbed. You are more likely to get a perfect crystal instead of a mass of crystals if you allow the crystal to grow slowly (cooler temperature, shaded location) in a place free of vibrations. Experiment with different types of table salt . Try iodized salt, uniodized salt, sea salt, or even salt substitutes. Try using different types of water, such as tap water compared with distilled water. See if there is any difference in the appearance of the crystals. crystals don’t stack perfectly on top of previous crystals. The solubility of table salt (or any kind of salt) increases greatly with temperature. You’ll get the quickest results if you start with a saturated saline solution, which means you want to dissolve salt in the hottest water available. One trick to increase the amount of salt you can dissolve is to microwave the salt solution. Stir in more salt until it stops dissolving and starts to accumulate at the bottom of the container. Use the clear liquid to grow your crystals. You can filter out the solids using a coffee filter or paper towel. Students will explain how the build-up of gas from dissolving alka seltzer tablet causes the lid of a medicine vial to blow off. Students will explain that build-up of gas pressure causes eruption of explosive volcanoes, and that the pressure comes from heating of dissolved gases in the magma. Students will discuss the similarities and differences between the model and actual volcano. Students will verbalize excitement of learning about volcanoes. This activity is an active simulation of an explosive volcanic eruption. The “volcano” (use non-childproof prescription medicine vials) erupts (the lid blows off) when gas pressure generated by dissolving an alka seltzer tablet is sufficiently high. It is realistic in that the timing of the eruption is difficult to predict precisely and in that the eruption occurs when the pressure of the gas exceeds the confining pressure of the lid. The experiment can be modified to show that an eruption will not occur if there is not enough gas pressure generated (small piece of alka seltzer) or if gas is allowed to escape gradually through holes punched in lid of medicine vial. Caution: allow students a clear view of the volcano but make sure that they stand a bit away to avoid anyone being hit by the volcano’s exploding top. Not all volcanoes erupt explosively and unpredictably. The eruptive style (quiet streams of lava versus violent blasts of gases, ash, and debris) and eruption frequency and predictability are related to the viscosity (resistance to flow) and amount of dissolved gas in the magma (molten lava prior to eruption). hot, runny magmas with little dissolved gas tend to flow smoothly out of vents and produce a volcano that is broad and not steep, such as the Hawaiian volcanoes. On the other hand, slightly cooler magma with a higher dissolved gas content is much more viscous. Instead of running out smoothly, the magma may ooze out like toothpaste, clogging the vent. These volcanoes are steeper and have the typical “volcano shape” of famous volcanoes such as Mt. Fuji in Japan. Under this type of volcano, gases dissolved in magma can separate as the pressure decreases when the magma rises closer to the Earth’s surface. If the gases separate rapidly and cannot escape immediately, they can build up pressure greater than that of the overlying rock. When this happens, they break the rock suddenly as a violent explosion occurs sending a plume of gas and ash upwards to heights as great as 20 miles. Commonly there is little if any lava extruded. The ejecta may consist primarily of ash, pumice (instantaneously cooled magma containing abundant trapped air), and debris blown off the volcano by the eruption. The force of the eruption can blast material tens of miles from the volcano, causing extensive loss of life and damage. It may take thousands of years for sufficient pressure to build to cause an eruption, and it is difficult to predict when a volcano that has long been dormant will become active. If the pressure were released gradually it would not build up to the point where it could cause an explosive eruption. Because they erupt infrequently, unpredictably, and violently, and because they occur in populated areas (e.g. Japan, Indonesia, Philippines, Pacific northwest of the United States, Central and South America), these explosive volcanoes pose the greatest danger to humans. Put about 20 ml (about 1/8 cup) of water into vial. Add a quarter of an alka seltzer tablet and quickly put on cap. Observe what happens for about 2 minutes. Repeat using a half of an alka seltzer tablet (Watch out!). Repeat using half of a tablet and lid with perforations that allow gas to escape. What happens? The lid on vial containing a quarter tablet will balloon upwards as the pressure increases, then deflate as it decreases, or it may possibly pop off gently. The lid on the vial containing a half of a tablet will bulge and then blow off violently, rising several feet in the air or travelling laterally 5 or 6 feet. The perforated lids will not blow off. Why? There is not enough gas generated by one quarter of a tablet of alka seltzer to build sufficient pressure to blow the lid off. However, the gas generated by a half of an alka seltzer tablet is plenty to blow the lid part way across the room, as long as the lid is put on quickly and firmly so that no gas escapes. Students can use the ballooning of the lid prior to its blowing off to predict when the lid will blow off. This is analogous to volcanologists predicting when an eruption will occur based on the measurable bulging of a volcano. If the gas is allowed to escape gradually through holes in the lid, the gas pressure from the dissolving alka seltzer will not build up to the point where it exceeds the confining pressure of the lid, and the lid will not blow off. Repeat each experiment several times. Using a second hand on a clock, time how long it takes the lid to blow off with the half tablet. Measure the distance that the lid goes. Data from several groups can be pooled, tabulated, and histograms made. Older students could research the eruptive history of a particular volcano, the effects it has had on humankind, and its potential for future destruction. Some famous volcanoes: Kilauea and Mauna Loa (both “nonviolent” volcanoes on the island of Hawaii), Mt. Vesuvius, Mt. Pinatubo (erupted 1991), Mt. Rainier, Mt. Lassen, Mt. St. Helens, Tambora, Krakatoa, El Chichon, Nevado del Ruiz (erupted 1985 causing 23,000 deaths in Columbia). some dramatic story or event for their assigned volcano.